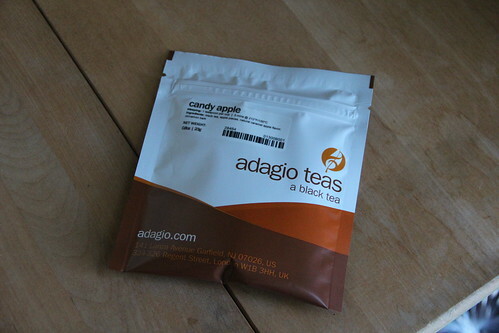 The final holiday themed tea I ordered this year was Adagio Teas‘ Candy Apple. I might add that Adagio had all sorts of holiday teas and I look forward to ordering and review others in the coming years. Candy Apple includes black tea, apple pieces, caramel flavor and cinnamon bark. It is available in the following sizes: sample for $2.00, 3oz for $6.00 and 16oz for $19.00. When I opened the package I could smell the caramel. Once I started brewing the tea, a sweet tangy apple scent emerged. 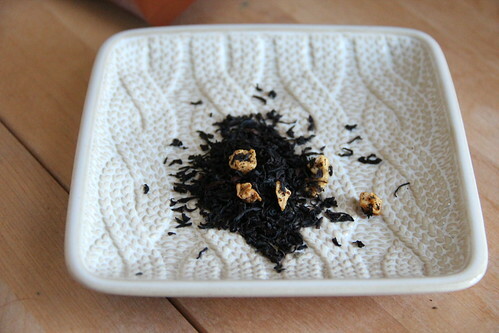 The tea was a good black tea with hints of apple and caramel. It wasn’t super sweet, but it was pretty tasty. If you love caramel apples in the fall you should give this one a try! Next Crafty: Last gasp of Christmas.